Q: What the heck do you use to muddle sliced fruit into a giant pitcher of sangría, whose surface area is too large for any standard mojito muddler? 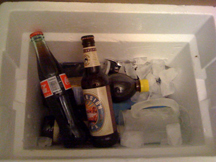 For a recent World of Warcraft raid, I actually dug a cooler out of our storage closet and filled it with ice, beer, Mexican Coke for me, and Diet Pepsi for Grant. You know, so we could enjoy our favorite beverages without having to get up in the middle of a boss fight.